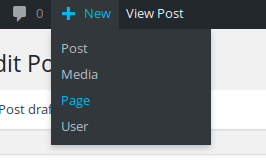 If you are new to using WordPress, the difference between pages and posts seems a bit amorphous. Heck, even for long-term users it can seem a bit difficult to wrap your head around. This is my take on how they are different. In general the “rule” is that posts are used for blogging, and pages are used for everything else. By blogging I mean where content is added regularly as new posts, and all posts appear on a main posts page. Posts are listed there by post date and can also use tags and categories. WordPress makes it easy for blog readers to subscribe to or follow the posts. Posts use RSS Feed and can use other approaches to push out a new post to subscribers. Pages in WordPress are more like pages in a traditional hand-coded website. Pages may be used to give a site a fixed home page and for pages such as ABOUT US, CONTACT US, etc. Pages do not use tags or categories and are not listed by date as posts are. Pages do not support RSS Feed or notifying readers of a new page being added. If your site is a business, non-profit, or personal business card site, you will be using PAGES almost exclusively. Your pages will be reached by the menu or other links defined on the site. Many business, organization, or news sites use a combination. They use some Pages to define the site and provide a structured message and also use regular blog posts to provide information and energy to the site. One notable functionality difference between pages and posts is the Read More Tag. Choosing the icon to insert the Read More Tag when editing ether a page or a post will insert the Read More Tag. For a post the Read More Tag lets you show only a teaser (the stuff above the read more line) on the main posts page rather than the whole post. When you click on Read More or the post title, the full post loads. Some Themes also provide another approach to provide teasers called excerpts. Excerpts are optional hand-crafted summaries that can be used in some themes. While excerpts require extra work and are not available or handled the same way in all themes the Read More Tag is always there and always works the same way. You can add the Read More Tag to the text in a PAGE, but it will do nothing. While both Pages and Posts can allow comments, generally pages are closed and do not allow comments. Blogs generally encourage readers to add comments and ask questions. Successful bloggers use comments and discussion to build a social network around their blog. This can be very powerful when it comes to increasing the reach of the blog and its standing in search engines. What are trackbacks and pingbacks? Trackbacks and Pindbacks are very similar. Under the hood they use different approaches to do more or less the same thing. You could call them remote comments. For example, if a person posts a link to a post from your blog on her blog. This automatically sends a pingback to the original blog assuming both have allow trackbacks and pingbacks enabled. Hopefully this was helpful and clarified some of the differences between pages and posts.